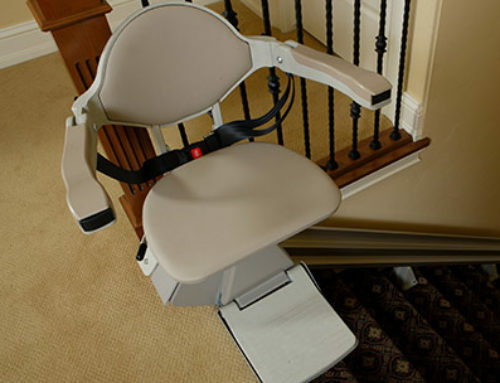 How do you know whether or not a stairlift installation would be right for you? We understand that it may be a shock to lose mobility and the ability to easily climb the stairs in your home. Simple tasks like carrying the laundry up the stairs can seem difficult, or even dangerous. If you are having difficulty with the stairs in your home and are looking for an option that does not involve selling your home and moving to a single story alternative, a stairlift may be a great option. Below is are the answers to some of the top questions we receive. While everyone would agree that stairlifts are useful to help individuals safely get up and down the stairs, no one can agree on what to call them. 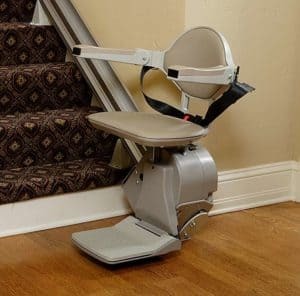 Names we have heard include: stair chair, chair lift, stair glide, stair lifter, and even “that thing that goes up the stairs.” While an expert in the industry will know what you are referring to regardless of what you call it, the most commonly accepted name is “Stairlift”. It is important to note that the stairlift installed by Jenkins DME will mount directly onto your staircase and not the wall. This mounting method makes the stair lift extra sturdy, and ensures that the lift is compatible with almost any staircase, whether it has walls or banisters on either side. The chair will run along a railing that is mounted to your staircase every few steps, depending on the angle and length of the staircase. The stairlift requires a charger which plugs into a standard wall outlet, the same as you would plug a lamp into, within 6 feet of either the top or bottom of the staircase (depending on the model). Additional questions? Jenkins DME provides stairlift installation and services Bruno stairlifts in the Central Pennsylvania area. Contact us today for a free in-home quote!